The "K4 Premium" with water-cooled motor - ideal for occasional removal of moderate dirt (e.g. vehicles, garden fences, bicycles). With hose reel for ease of use. The "K4 Premium" features a water-cooled motor and is ideal for occasional use around the home. 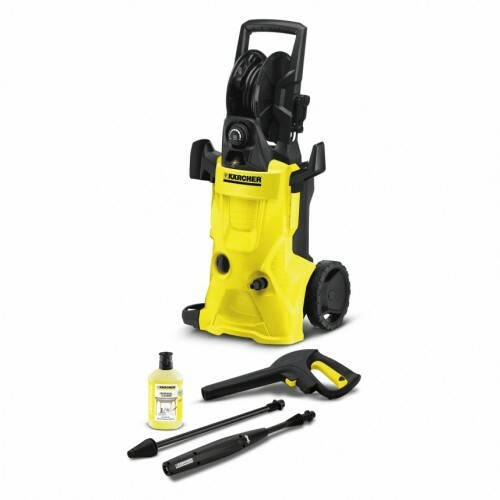 This high-pressure cleaner is ideal for removing moderate dirt, e.g. on small vehicles, garden fences or bicycles. This machine features a hose reel for ease of use and storage. Include a gun with Quick Connect connector, 6 m high-pressure hose, Vario Power spray lance (VPS), dirt blaster with rotating pencil jet for removing stubborn dirt, water filter for pump protection and P&C universal cleaner. The pressure can be adjusted by simply twisting the VPS - for effective and surface-friendly cleaning.